We hereby proudly welcome a member organisation in the CML Advocates Network: The "CML Saudi Group", which is a part of the "Saudi Cancer Foundation" based in Saudi Arabia. The CML Advocates Network now counts a total of 106 member organisations in 81 countries worldwide! See the list of CML groups in the Network on our world map. We hereby proudly welcome two new members to our network: The "Taiwan Bone Marrow Transplantation Association" based in Taiwan and "CML Busters Family Support Group of California" based in the USA. The CML Advocates Network now counts a total of 105 member organisations in 80 countries worldwide! See the list of CML groups in the Network on our world map. We are looking forward to the 14th CML Horizons conference, held in Ljubljana / Slovenia on 6-8 May 2016. The CML Horizons Steering Committee has worked hard to ensure that the conference includes topics of importance to the CML patient community, and provides a unique opportunity for participants to share experiences and best practice. We hope that as a result of this meeting, CML patient groups globally will improve their capacity to meet the needs of their patients, and strengthen their advocacy activities. Registration is now open for leaders of CML patient organisations. 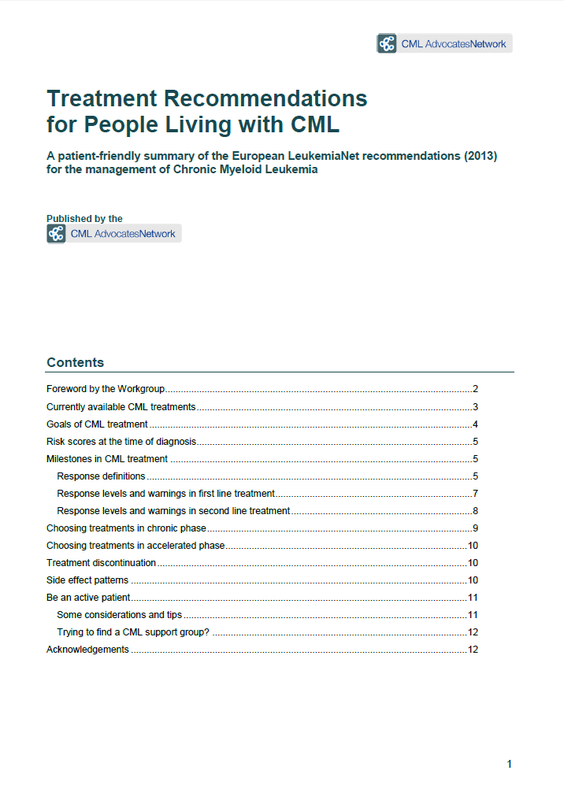 The CML Advocates Network, advised by medical experts, has developed a lay-friendly summary of the ELN Expert Treatment recommendations for CML. It is now available in 19 languages: English, Arabic, Albanian, Azerbaijani, Bulgarian, Chinese (traditional and simplified), Danish, Dutch, French, Georgian, German, Hebrew, Italian, Polish, Portuguese, Russian, Serbian, Spanish and Turkish (new: Albanian, a big thank you to Jeton Lika (Kosovo Association for Support to Chronic Leukaemiae Patients) and Dr Aferdita Ukimeraj (Director of the department for Haematology, University Clinical Centre in Pristina, Kosovo) for translating, reviewing and approving this new version of the lay-friendly summary! Two new animated patient videos: Carin´s & Michelly´s story are now available! We hereby proudly welcome a new member to our network: "K.E.F.I. of Athens" Association of Cancer Patients of Athens, based in Greece. The CML Advocates Network now counts a total of 103 member organisations in 79 countries worldwide! See the list of CML groups in the Network on our world map. Today is World CML Day - 9/22! TODAY IS WORLD CML DAY! One day, one community, one life changing reality… Today, we are together to make a status, share and involve on our needs! 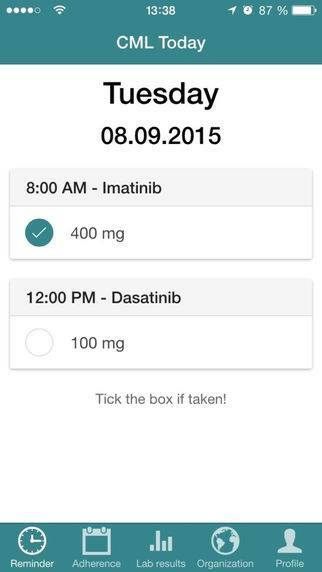 Today on World CML Day, the CML Advocates Network is launching its brand-new mobile CML ADHERENCE APP “CML Today” for CML patients to support adherence to TKIs as well as to track their PCR results. 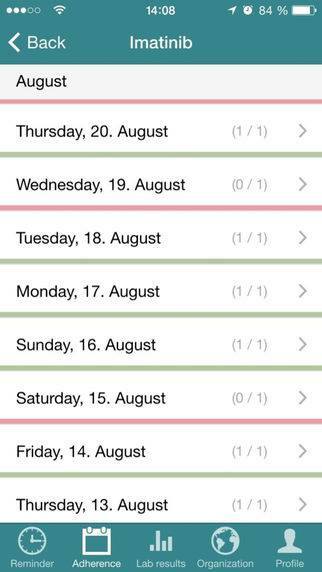 The mobile app is available for free in English, French, Spanish, German, Portuguese, Arabic, Hebrew, and more languages will follow soon. Find „CML Today“ in the Apple App Store (iphone) and in the Google PlayStore (Android). Please talk about “CML Today” and encourage CML patients to use “CML Today”! Please also check out the activities that are being carried out all over the world on World CML Day 2015 and the campaign materials developed by members of the CML Advocates Network. More information on World CML Day 2015 can be found here. The CML Advocates Network wishes everybody an inspiring and successful World CML Day 2015! Polymerase Chain Reaction, a very sensitive diagnostic test that allows the detection of certain genes (DNA) on a very sensitive level. PCR can detect up to one single gene in about 1 million genes. On World CML Day on 22 September, the CML Advocates' Network will launch a mobile app for CML patients to support adherence to TKIs as well as to track their lab results. In order to make all our information available more conveniently wherever you are, the cmladvocates.net website is now also smartphone-ready. All information on cmladvocates.net, e.g. the news on the homepage, are now optimized for small screens when accessed from mobile phones. ... is the motto for this year´s World CML Day campaign! One day, one community, one life changing reality… Today, we are together to make a status, share and involve on our needs! To help our members spread the message of awarenss and strenghten their voice, this year the CML Advocates Network is providing a World CML Day "Toolkit" that includes adaptable artwork for print and online use (posters & flyers), a photo-database, a press release and communication guidelines containing valuable strategies and hints for how to get the most out of the campaigns. Visit our World CML Day Section on this website to learn more about World CML Day, about this year´s campaign and about key initiatives planned and campaign materials prepared by our members for this Sept 22. Wishing you all an inspiring and successful World CML Day 2015! We hereby proudly welcome a new member to our network: CFР «DROP BLOOD», based in Ukraine. The CML Advocates Network now counts a total of 102 member organisations in 78 countries worldwide! See the list of CML groups in the Network on our world map. Please help us promote the book! And remember: CML Advocates Network Member Organisations can order copies of the books at production price (8.50 EUR per book incl. VAT, excluding shipping costs)! Order your copies now! All non-members can buy the book via Amazon.co.uk and Amazon.de - Amazon ships the book world-wide! It is now available in 17 languages: English, Arabic, Azerbaijani, Bulgarian, Chinese (traditional and simplified), Dutch, French, German, Hebrew, Italian, Polish, Portuguese, Russian, Serbian, Spanish and Turkish (new: Azerbaijani, a big thank you to Mehriban Bagirova from the Charter of Figthing of Leukemia Public Union Azerbaijan). Patient advocacy at the EHA 2015 congress in June 2015 in Vienna/Austria: presentations now available!